A surge of more than 40 per cent in oil prices has helped make the Canadian dollar one of this year’s best performing major currencies. That resiliency could soon be tested if crude loses momentum. Many forecasters appear skeptical about the prospects for oil to advance much beyond its current level, potentially sapping some support from the loonie. West Texas Intermediate was at around US$64 per barrel on Friday and the median forecast in a Bloomberg survey is for it to end the year around US$63. 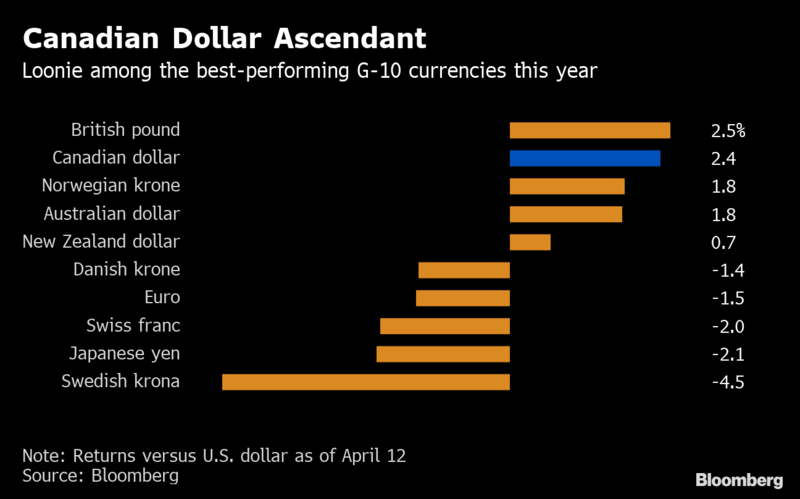 The Canadian dollar has advanced 2.4 per cent this year against the U.S. currency, trailing only the British pound among its Group-of-10 peers. Oil has provided some buoyancy, but Canada’s domestic picture has been more cloudy. There is mounting concern about household indebtedness, home prices are dropping and growth practically ground to a halt in the final part of 2018. He sees the loonie weakening to around $1.36 per greenback by the end of this year and $1.40 in 2020. It was at $1.3323 on Friday. Eric Theoret at Scotiabank sees a weak greenback environment fueling commodity-price gains and boosting Canada’s terms of trade, and says there’s room for improvement in the currency if crude prices continue to rise. Even if oil recovers, RBC Wealth Management expects the Canadian dollar to trade around its current levels until mid-year, with some modest softness taking it to a range of C$1.34 to C$1.36 per dollar by year end. Laura Cooper, head of FX solutions and strategy at RBC Wealth, sees limited scope for oil to bolster the loonie because pipeline constraints are helping to maintain a price gap between Canadian crude and the U.S. benchmark price. She’s also doubtful of any major shift from rate differentials, since both the Federal Reserve and the Bank of Canada are signaling extended tightening-cycle pauses.